Notes: [Admitted to MedChi 1897]. Born at Baltimore, February 21, 1869. A.B., Johns Hopkins University, 1893; M.D., University of Maryland, 1895; Coroner, 1896; Lecturer on Materia Medica. 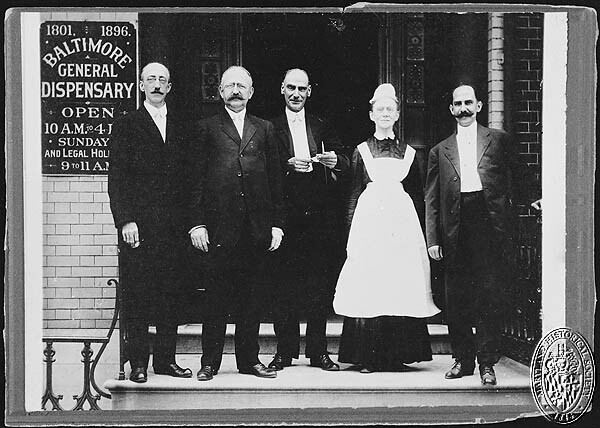 Woman’s Medical College, 1897-; Chief of Clinic in Skin Diseases, University of Maryland; Physician to Shelter for Aged Colored Women; Medical Examiner, American Legion of Honor. 827 North Eutaw Street. Baltimore. Notes: ABERCROMBIE. — On August 3, 1944, at his home, 3524 Greenmount avenue DR. JOHN R., husband of Dr. Anne S. Abercrombie. Dr. John R. Abercrombie, one of Baltimore’s oldes practicing physicians, associate professor of dermatology at the University of Maryland Medical School and one time dean of the former Woman’s Medical College of Baltimore, died yesterday at his home, 3524 Greenmount avenue. Dr. Abercrombie suffered a heart attack on February 10 but observed his 75th birthday, February 21, by entertaining the Splint Club, an association of Baltimore physicians, at a dinner at his home. Shortly after that he was confined to his bed and death followed a second heart attack yesterday. He was dean of the Woman’s Medical College of Baltimore form 1906 to 1910, when the school was discontinued for lack of financial support. The school had had a remarkable record. For ten consecutive years no graduate had failed before examining boards in the United States or abroad. In addition to having served as dean of this school, he also had been professor of materia-medica, therapeutics and dermatology. The son of John and Elizabeth Sarah Daniel Abercrombie, Dr. Abercrombie was born in Baltimore and was graduated from the Johns Hopkins University in 1892. He had played on the school’s championship lacrosse team. In 1895 he received his medical degree from the University of Maryland Medical School and was resident physician at University Hospital for two years. In 1909 he married Dr. Anna D. Schultz, one of his former pupils at the Woman’s Medical College of Baltimore, and the two practiced medicine together for 35 years. Dr. Anna Schultz is a physician for women. While specializing in dermatology, Dr. Abercrombie’s interest in obstetrics led him into general practice. Many of those at whose births he officiated kept in touch with him during their adult years and just before his death occurred yesterday he received a letter from one of them, a chemical engineer. Inclosed was a letter from the man’s 10-year-old child thanking the doctor for pictures of birds sent him. A lover of nature, Dr. Abercrombie had for a hobby the raising of bees, on which he was an authority, and he often distributed honey to his friends. He also was a member of the Fish and Game Association. Of Scotch descent, he and his wife made two tours of Scotland, once in 1930 and again in 1937. He took a great interest in Scotch lore, was a past president of St. Andrew’s Society and had the Scotch dish, the haggis, served at his home. His wife also had recipes for Scotch cookies which the two sent to friends at Christmas. Funeral services will be held at 10 A.M. Monday at Grace and St. Peter’s Church, where he was a vestryman, and burial will be in Greenmount Cemetery. Surviving, in addition to his wife, are three brothers, Dr. Ronald T. Abercrombie, former athlectic director of the Johns Hopkins University; Harry N. Abercrombie, of Baltimore; Robert Fulton Abercrombie, of New York, and two sisters, Miss Maude Abercrombie, of Chatauqua, N.Y., and Mrs. Edwin Berner, of California.